Sun-screening and hail protection shade structures consisting of a tensioned membrane fabric attached to a permanent steel frame. Made from high density abrasion resistant polyethylene fabric with UV stabilizers blocking out 98% of harmful rays. Raschel-knitted in fine vertical ridges on the outside and crisscross ribs on the inside. This strong knitting pattern ensures material will not pull apart or unravel when cut or damaged. All corners reinforced with extra non-tear cloth and strap. The solar shade cloth provides 85% shade. Thess long lasting canopy shade structures will protect your outdoor furniture from damaging weather including hail with a burst strength of 3.7 Kn. Fabric is designed to handle sustained winds up to 76mph (hurricane force 1). 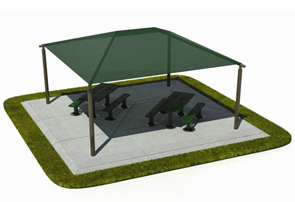 Frame structure can handle winds up to 145mph providing shade canopies have been removed per requirement. 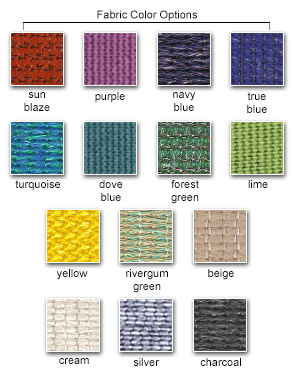 Shade is available in the fabric colors shown. 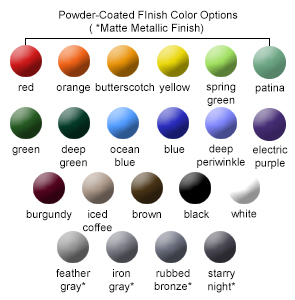 The frame is made from galvanized Post coated with your choice of powder-coat colors displayed. 16' L x 16' W.
8' Entry Height with 11' Peak Height. Wire Rope Shade Support Cable. 3-1/2" 11 Gauge Steel Post.